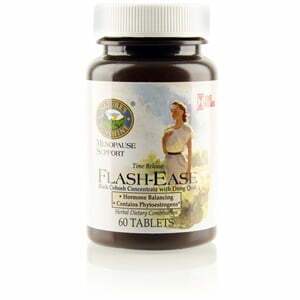 Nature’s Sunshine Flash-Ease, Time Release is a formula that provides the health benefits of black cohosh throughout the day. Black cohosh, a herb that grows in the West, has been traditionally used for menopausal support, especially for relief during hot flashes. The formula also contains dong quai for additional glandular system support. 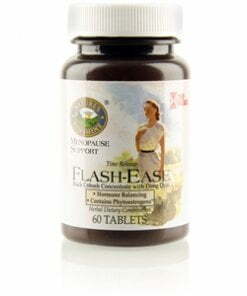 Flash-Ease T/R is standardized to a 2.5 percent concentration of triterpene glycosides. Instructions: Take one tablet in the morning and one at bedtime. Each specially processed tablet slowly releases its contents providing optimal day and night protection and delivers 2 mg of triterpene glycosides. Maltodextrin, cellulose (plant fiber), stearic acid (vegetable), di-calcium phosphate, and magnesium stearate (vegetable), and silicon dioxide (powdered silica).